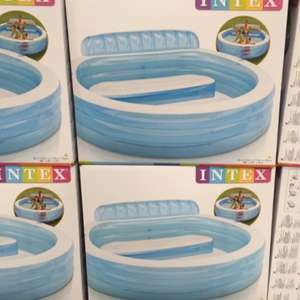 Intex 88" inflatable paddling pool/swimming pool. £23.98 in Costco Birmingham warehouse, however I'm lead to believe that this is a national offer. Absolute bargain! Yea, in Glasgow too. Wasn't allowed one tho. I can confirm this in the Thurrock branch. My neighbour has one, its huge, but looks fantastic fun... Their kids love it, young and teens. Probably cause they all knew they wouldn't be allowed in... Mine.. All mine. Lol. Heatwave, will probably need a snow shovel more like ! Shame I'm on a water meter. Grrr!!! I want one how many at lakeside? They have the 10ft one at costco but it comes with an additional pump and pool cover, and iirc it was only 35 squid! did the staff say you were too fat or something ? Can't find it on the website, maybe sold out..? anyone know if there are any in Gateshead store? 2 or 3 days is not a heatwave, for goodness sake wish the media would stop spreading rubbish. Got mine from Glasgow today. Just make sure you've got a pump for it also. Just checked the website and they aren't even on it anymore. They were never on it in the first place. Most of Costco's offers are in store only.